Bad weather can strike in any season, of course. 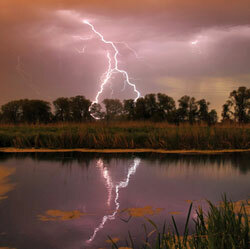 But spring often seems particularly prone, as showers turn into thunderstorms and gentle breezes turn into tornadoes. The National Oceanic and Atmospheric Administration has some suggestions for staying safe in spring storms. Since 2003, tornado watches have been issued in 43 states, severe thunderstorm watches have been issued in 49 states, and lightning strikes have occurred in every state. More than half of deaths related to freshwater flooding occur when motorists drive into floodwaters. As little as 12 inches of water can carry off a small car. Wildfires kill an average of 30 people and destroy an average of 2,800 homes every year. Heat – which can come early in the southern parts of the country -- results in hundreds of deaths a year and is one of the leading weather-related causes of death. Once you understand the threats you might be facing, know what to do to stay safe. Watch the weather. If you live in an area where tornadoes and thunderstorms might occur, pay attention to weather forecasts and emergency warning systems. Don’t go outside if there is a serious chance of high winds, lightning or other storm events. Have a plan. Know what to do in case of a tornado, high winds or flooding. You might not have much time to act, so choose a safe place ahead of time. Conduct drills, especially if you have children, so that everyone understands what to do and where to go. And have a plan for communicating when the danger passes. If you or your children play outdoor sports, check with the school or organization in charge to make sure there is a lightning policy in place, and that it is strict enough to ensure the safety of players and spectators alike. Lightning can strike before a storm is actually upon you, even if the skies are not threatening. Many sports fields have lightning detectors that can set off an alarm when lightning is still miles away. Never drive through water unless you are absolutely sure that it is no more than a few inches deep. Be particularly cautious in areas along creeks and other areas that are prone to flash floods. Reach out to people who might not know about the danger, and check in on people who might need help, such as those who are elderly or sick. Finally, if you are traveling, be aware of the potential dangers in the area where you are going. For example, if you are going to the ocean, know where you might encounter rip tides or dangerous currents. Check with lifeguards and locals before you hit the surf. And always make sure someone knows where you are going and when you expect to be back.